BACKGROUND: Frail older adults are increasingly expected to self-manage their health and healthcare. We assessed the extent to which this group is able to take up this responsibility by measuring their level of activation as patients (i.e. their knowledge, skills and confidence to self-manage their health and healthcare). 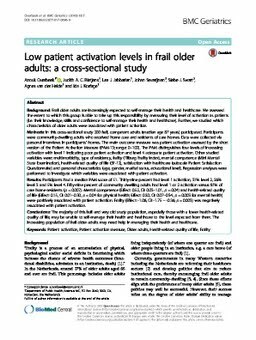 Further, we studied which characteristics of older adults were associated with patient activation.METHODS: In this cross-sectional study 200 frail, competent adults (median age 87 years) participated. Participants were community-dwelling adults who received home care and residents of care homes. Data were collected via personal interviews in participants' homes. The main outcome measure was patient activation assessed by the short version of the Patient Activation Measure (PAM-13; range: 0-100). The PAM distinguishes four levels of increasing activation with level 1 indicating poor patient activation and level 4 adequate patient activation. Other studied variables were: multimorbidity, type of residency, frailty (Tilburg Frailty Index), mental competence (Mini Mental State Examination), health-related quality of life (SF-12), satisfaction with healthcare (subscale Patient Satisfaction Questionnaire) and personal characteristics (age, gender, marital status, educational level). Regression analyses were performed to investigate which variables were associated with patient activation.RESULTS: Participants had a median PAM score of 51. Thirty-nine percent had level 1 activation, 31% level 2, 26% level 3 and 5% level 4. Fifty-nine percent of community dwelling adults had level 1 or 2 activation versus 81% of care home residents (p = 0.007). Mental competence (Effect: 0.52, CI: 0.03-1.01, p = 0.04) and health-related quality of life (Effect: 0.15, CI: 0.01-0.30, p = 0.04 for physical health; Effect: 0.20, CI: 0.07-0.34, p = 0.003 for mental health) were positively associated with patient activation. Frailty (Effect: -1.06, CI: -1.75 - -0.36, p = 0.003) was negatively associated with patient activation.CONCLUSIONS: The majority of this frail and very old study population, especially those with a lower health-related quality of life, may be unable to self-manage their health and healthcare to the level expected from them. The increasing population of frail older adults may need help in managing their health and healthcare.